Behavior charts. Behavior charts are a great way to motivate kids and help them eliminate negative behaviors. Not only can behavior charts help kids get a handle on tricky behaviors, but they can help kids keep track of chores, homework, reading, instrument practice, pet care and more. For behavior charts to work most effectively, you need to use them correctly. Before using a behavior chart, take a look at some of our pointers below. Don't forget to look at our Example Behavior Charts too. And here is a printable version of "How To Use Behavior Charts". Make it a fun and positive experience. The point of the chart is to emphasize positive behaviors, not the negative ones. You can make it a game with very young children. With older kids you can involve them in designing the chart or giving input regarding what behavior/chores the chart will include. Be consistent. Once you start a chart, follow through. If the chart is a weekly chart, finish through the week. If you commit to a month, finish through the month. I would suggest giving a behavior chart at least one month before giving up. Hang the chart in a location that is easily visible. The kitchen or bedroom can be a great place for a chore chart, the bathroom for an oral hygiene chart, and a behavior chart can go in a kitchen or bedroom. Put the chart back in the same spot daily after filling it out. Remember, you need to model consistency by keeping up with the chart. Don't we expect our kids to be consistent when working on negative behaviors? Make expectations attainable. You want your behavior chart to be a success. Make sure that your expectations are realistic for your child or the chart will become a frustrating experience. Expecting your child to get A's on every school assignment or use the potty every day may be unrealistic and frustrating to both you and your child. In addition, don't fill your chart with too many expectations or chores. Your child may feel overwhelmed. You can even target one behavior or chore at a time. Don't set your child up for failure. Don't expect perfection. We all have days that are more difficult than others. Like I said earlier, emphasize the positive. Make it a success if your child succeeds even 3 days out of seven. Make sure you recognize her achievements even if she doesn't seem to be doing as well as you had hoped. Change takes time. Set up a point or reward system that is fair and realistic for your child. Use behaviors that are easy to track. It is easier to keep track of "complete homework daily" or "get dressed for school in the morning" as opposed to "get along with sibling". "Get along with sibling" is too general and difficult to track. It is also subjective and your idea of getting along with a sibling may differ from your child's or spouse's. Be specific in stating your expectations and make sure that your child has a clear understanding of the chart. Use simple rewards. As mentioned earlier, very young children usually find the chart itself rewarding. If you use a chart that requires your child to color in a space each day, go out to the store and buy some new crayons or markers together to use as special chart markers. Stickers also work great with young kids. 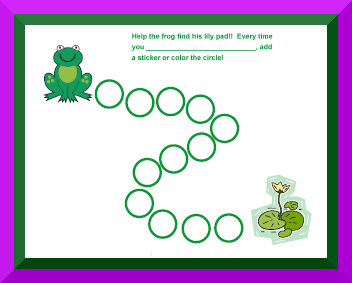 Have your child assist in picking out special stickers to use on the chart. The best types of rewards are activities that kids can participate in with a family member: a special outing with a parent, an art project, or a sleepover at grandma's house. Older children might earn extra video game time or a chance to have a friend sleep over. Teens could earn a chance to use the car or extra time added to a curfew. Most important is that you sit down with your child and decide together what the reward will be for his effort. The possibilities are endless. Use easy point systems. If you are using a chart with a point system, make it simple. For instance, if assigning points in a chore chart, use low numbers like 2 points per chore. Maybe you'll give 1 point if the chore is not done correctly and 2 if it is. Don't bog yourself down with too many points. Also, kids who will be using point systems need to be old enough to understand the math involved. Otherwise, the child may become frustrated. Finally...If a behavior chart does not seem to work well with your child after giving it a good effort, finish up the chart and let your child know that maybe you should try some other options. Don't imply that it was your child's fault the system didn't work. Charts don't work for all behaviors or all children. And, if your child still wants to continue with the chart, by all means you should keep it up. Change may be around the corner. Your child may just be enjoying the time spent with a parent working on the chart!